Department of Pathology and Laboratory Medicine, Medanta-The Medicity, Gurgaon, India. Received: July 23, 2015; Revised: July 29, 2015; Accepted: August 24, 2015; Published online: March 27, 2017. A 60-year-old man presented with fever for 2 weeks. Ultrasonography and contrast-enhanced abdominal computed tomography revealed retroperitoneal and mesenteric lymphadenopathy. Fine-needle aspiration cytology of a right inguinal lymph node showed a monotonous population of abnormal lymphoid cells, suggestive of non-Hodgkin's lymphoma. 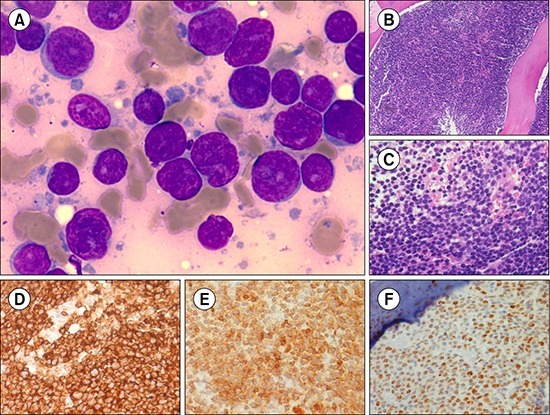 Bone marrow (BM) aspirate revealed sheets of abnormal lymphoid cells (90%) on a background of lymphoglandular bodies (A, Leishman and Giemsa stain, ×1,000). BM biopsy showed sheets of abnormal lymphoid cells (B, C, hematoxylin-eosin staining, ×100, ×400) that were immunopositive for CD20 (D), CD5 (E), and cyclin D1 (F), and negative for CD10 and CD23. The final diagnosis was mantle cell lymphoma. Lymphoglandular bodies are round, pale, basophilic fragments of cytoplasm in lymphoid tissues. They are most commonly seen in fine-needle aspiration cytology smears in cases of hematolymphoid neoplasms, and more often in B-cell neoplasms than T-cell lymphomas or myeloid leukemias. Whenever a BM aspirate shows lymphoglandular bodies, a high index of suspicion for hematolymphoid neoplasms, especially B-cell neoplasms, should be kept in mind. Furthermore, in high-grade lymphoma with blast-like morphology in the BM, presence of lymphoglandular bodies may favor a diagnosis of lymphoma rather than acute leukemia, which can be further confirmed and classified by immunohistochemistry.